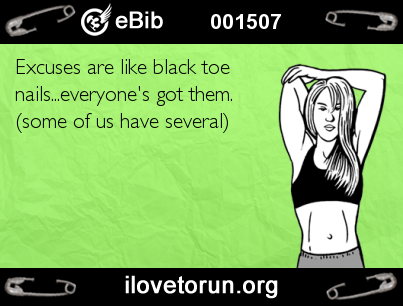 Well, I am a marathoner. Never would I have ever believed I could be saying something like that. 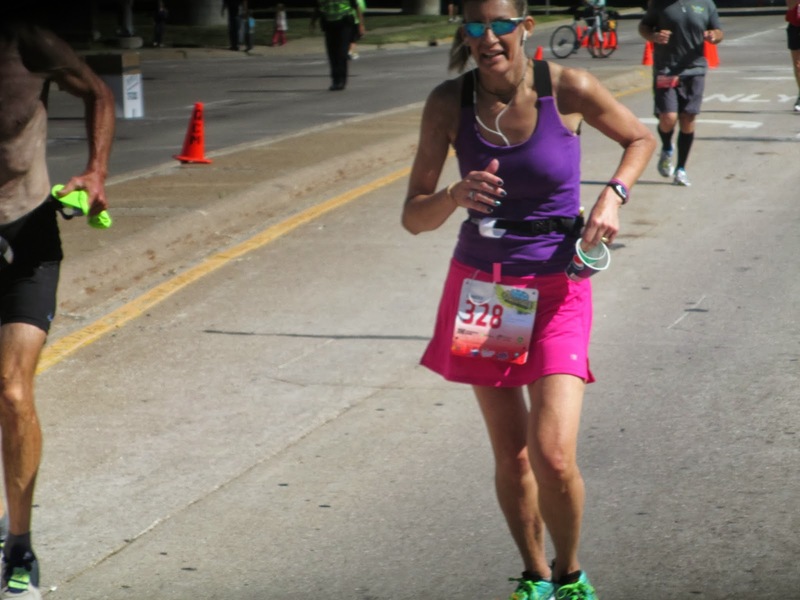 Running a full marathon is one of those rare life experiences that was every bit as hard and challenging as I imagined it to be, but then again...not. I am one of the lucky ones whose first marathon was more fun than pain or frustration. 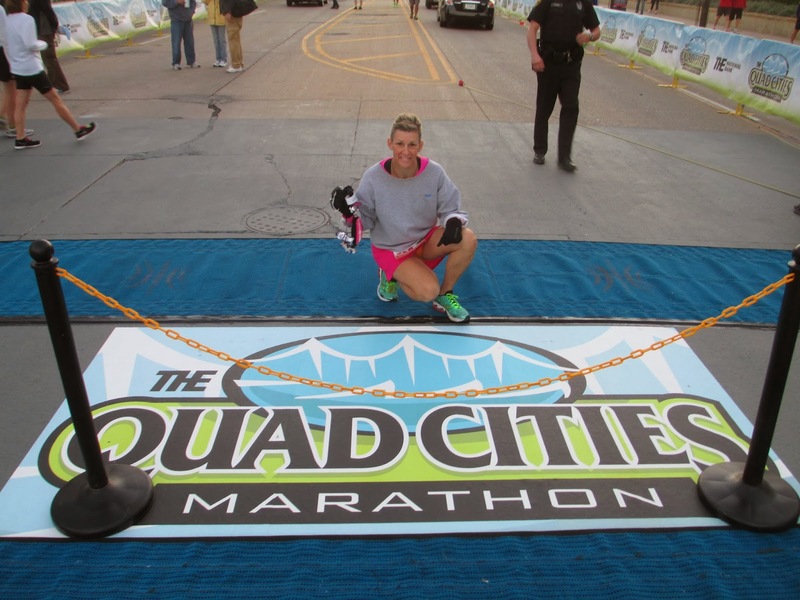 The Quad Cities Marathon is now in its 16th year, and there also was a half marathon, 5K (run and walk), 1-mile walk and a 5-person relay team option for the marathon. And what a phenomenal job the committee and volunteers did in pulling off this grand event. I had two pretty solid weeks of tapering following my half marathon (which was a week following my 20-mile run). I was so thankful to go through the taper. I welcomed the rest and recovery, but I dreaded the "hurry up and wait" anxiety that proceeds the event for which said tapering is occurring. 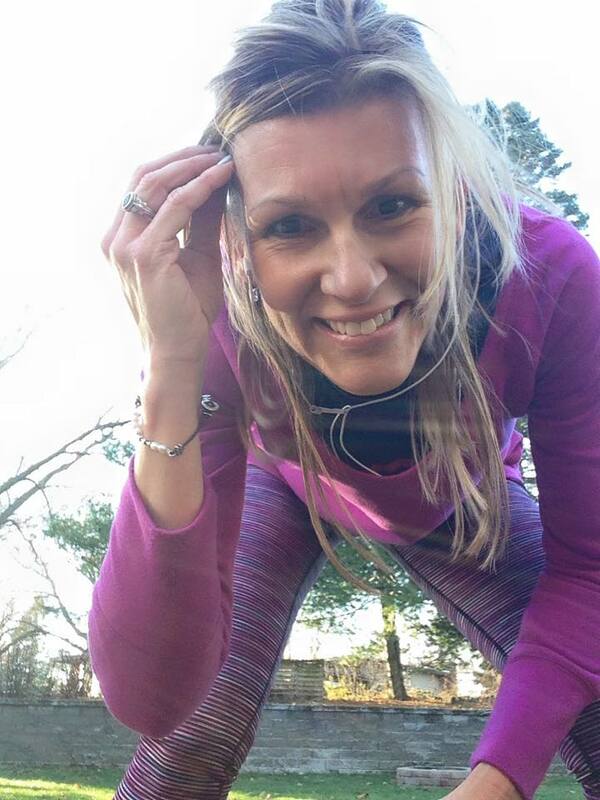 I am also paranoid about injury and over-training, so I took it very easy during the taper...which means the emotions ran high (no pun intended) with minimal exercise to release them. For the past several days leading up the race, I was constantly fighting back tears whenever I envisioned myself crossing the finish line. We're talking full-on tears about-to-overspill and that nasty lump in the throat. It was just so incredible to think I would be running a marathon, not "just a half," but a full 26.2 miles. All races for this event started together at 7:30. I'm not sure I agree with that format...it was really crowded as we made our way towards the first bridge. We did, however pass by a local school band playing "Sweet Caroline." Several runners tried singing along, and I sincerely hope they do not quit their day jobs (just saying). Once on the bridge, it was very crowded. We were condensed into one lane of traffic. 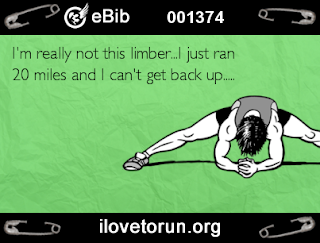 It did prevent me from starting out too quickly, but it also had me running much slower than I felt comfortable with. The first mile took me about 11 minutes, much slower than ideal for the pace I needed. Once off the bridge, we could spread out as we approached the "one hill at the start of the race." We had been warned about this hill. It was not steep, but very long. I was able to gradually make up some of my time from the slow start, though, and made it to the 2-mile mark by 19 minutes. Then I got in my groove, and got to mile 3 by 28 minutes. My pace continued on very steady for the next several miles. 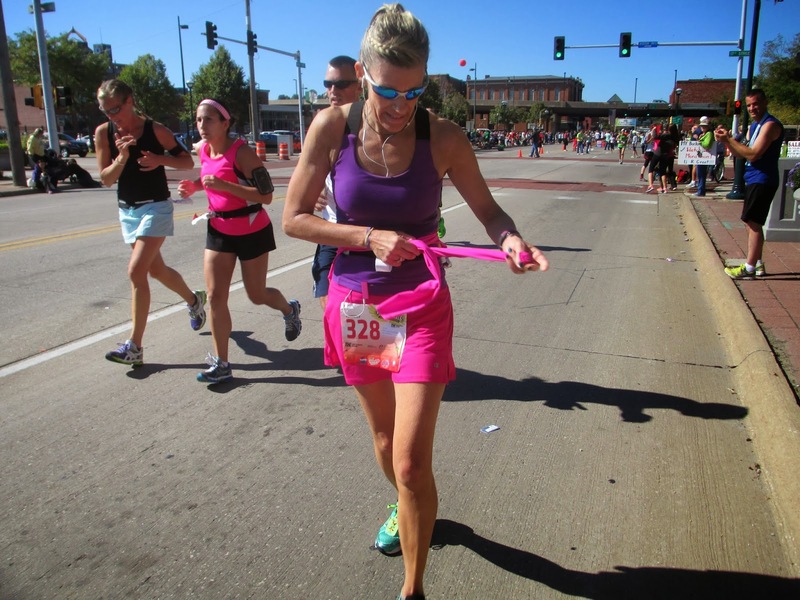 Every time I glanced at my watch at the mile marks, it confirmed my pace was dead-on. 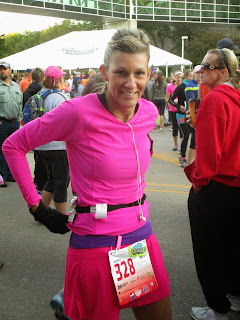 I kept fueling (with gels) every 6 miles or so, and drank water and/or Gatorade at every water station. 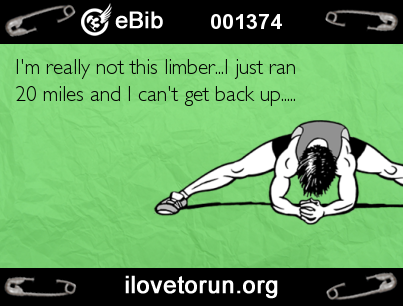 I am an emotional person, so there were a few times while running that I could feel tears welling up. UGH. Hopefully none of the photographers would capture me doing the "ugly cry" with my medal at the finish line. So, I continued onward. This race is really unique in that in encompasses four cities on the Iowa/Illinois border (QUAD Cities, get it? ), as well as a small island, the Rock Island Arsenal. We crossed the Mississippi River via several bridges at various times along our way to the 26.2 finish line. I mentioned there was the "one" hill just after the start of the race, but truthfully, there were several more. Each time we crossed a bridge to another city (or, on occasion, to another state), we climbed an incline to get there. Not a big deal. 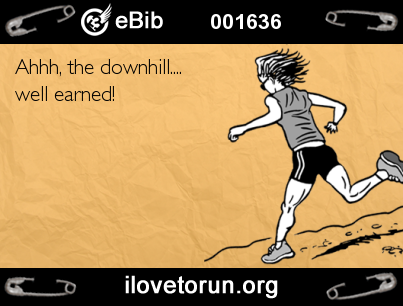 Actually having a few hills is really a good thing, it gives your muscles a break from the otherwise flat course. I made it to the halfway point in just over 2 hours, my pace was still doing well. As I approached the 14-mile mark, I pulled out a granola bar for a quick snack. I walked for a few minutes as I attempted to eat the bar, but it was not as easy as planned (the eating, not the walking). The lack of saliva in my mouth made chewing and eating and (eventually) swallowing a very long process. Finally after several minutes of chewing, I threw the last part of the bar away. Epic fail! I was also in need of a tissue...in a moment of desperation, I grabbed a discarded wash cloth off the ground (yes, I know, EEW!) and blew my nose. Done. The next 7 miles or so were on the island, which is a private military setting. Therefore, there were very few people along the route, other than the volunteers manning the water stations. It was very scenic and peaceful, but for a race of this distance I would have preferred to have some spectators clapping and cheering along the way. The temps were ideal, though. It was in the mid-40's at the start of the race, and never got above the mid-70's. There also was a gentle breeze, so I never felt hot or over-heated. Eventually, I made my way off of the island...via another bridge, of course. As I approached mile 20, I could tell my pace was starting to slow down. I still felt energized, but I knew this race was far from over. I hit the 20-mile mark in 3:22, which is the exact time I clocked for my 20-mile training run. Since I was hoping to finish in 4:15, I would really need to focus to knock out the final 6.2 miles in 53 minutes. If I had not just run 20 miles and, instead, was starting a fresh race, this would not have been an issue. But this was a marathon. 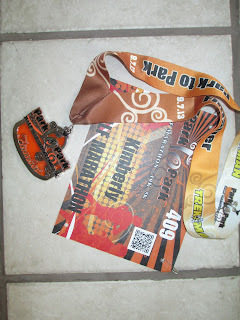 My first-ever marathon. I wanted to just continue to enjoy the experience itself; the 4:15 finish really was not a priority. As luck would have it, a little farther down the road, just around the final corner, was my cousin, Jessica, and her husband and three children. They all called my name and high-5'd me. Then, just a bit farther I spotted my husband and youngest daughter, Liliann! More high-5's and cheers! I was almost to the finish line! Six miles stood between myself and my victory. I could feel my pace progressively getting slower, but I never had the desire to stop or even rest. I knew in another 10 minutes or so there would be another water stand, and another after that, and so on. I also knew that I was feeling pretty thirsty, so I would need every cup of water or Gatorade offered to me. I had one remaining gel, so I gulped that down as I approached the water stand at mile 21. I walked as I drank, and I continued walking for a minute or so afterwards. I was about to finish a marathon! I kept going, pausing at each of the remaining stations, and just enjoyed each and every moment. The sun was shining brightly, there was a great breeze and there were a lot of people cheering throughout these final miles. I could feel my calves starting to cramp slightly, so I took it easy and didn't force anything. You can't see him very well, but the guy to the left is Dean...my last mile hero! Just after mile 25, a gentleman passed me and encouraged me to not stop this close to the finish. I assured him I was just enjoying myself. He said, "C'mon! I'll run you in!" I threw the empty water cup and joined him. 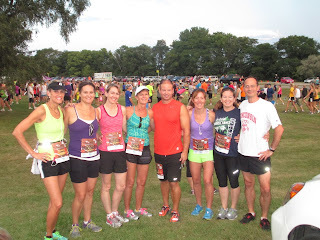 We chatted about how great the race had been. I asked him how many of these races he's done, and he said he'd done every Quad Cities Marathon...this was his 16th! I told him it was my first marathon. He gave me a high-5.....then yelled to the crowd, "Hey everyone! 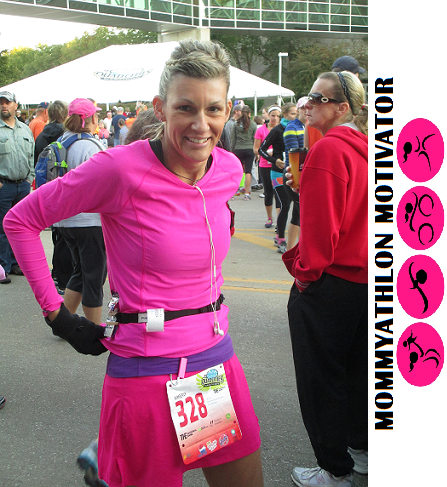 This is Kim, and it's her first marathon!" So, tons of applause and cheers came at me. This continued, every 100 steps or so, until we saw some kids waiting to high-5 us. It was my cousins and my daughter again! My husband got my picture, and high-5'd me as well. Before I knew it, we were crossing the finish line. I had been worried about crying, but I was so happy, relieved, and proud...there were no tears. I had done it! 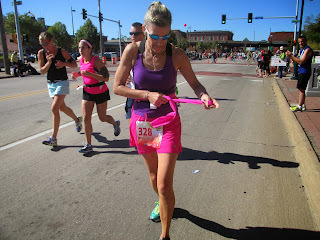 I had crossed the finish line of a marathon. This gentleman, Dean, immediately shook hands with another guy once we were inside the finishers' corral. He then introduced me to this guy who was none other than Joe Moreno, the race director! Joe immediately grabbed my hand, congratulated me, then thanked me. 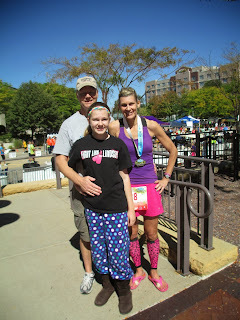 He told me he was so honored that I had chosen the Quad Cities for my first marathon. Honestly, I do not know how I managed to get through that final mile with Dean (and all the cheering and celebrating) without crying.....maybe I was dehydrated or something (I had just finished a marathon, after all). My official finish time was 4:33:38. I did not make my 4:15 goal, but it truly was such a magical experience, I honestly do NOT care about those extra 18 minutes. The entire race was wonderful, from start to finish. I feel very fortunate. 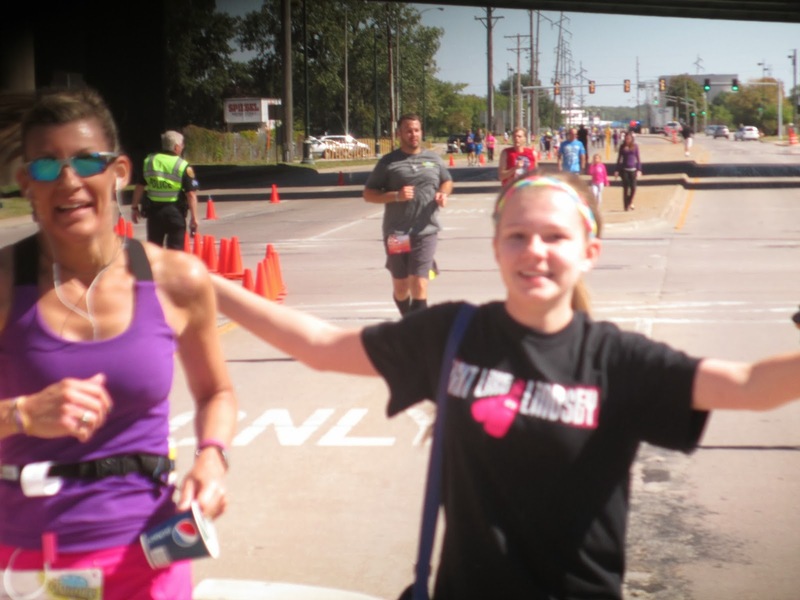 My first-ever marathon was pretty much everything I could hope for. 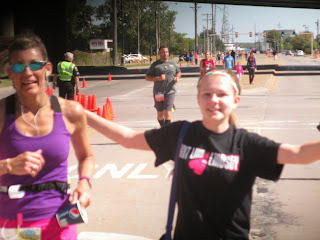 I felt energetic for most of the race. I think I managed the hydration and fueling well for 26.2 miles. No carb crashing, no feelings of quitting, no "hitting the wall" and no regrets. Even when I was periodically walking during those last couple miles (and knew I could have been running), I never felt disappointed in myself. Really, running this marathon wasn't that much harder than running a half marathon...just twice as far! I've sat down...and I can't get back up! So, could I have trained harder? Should I have trained longer? 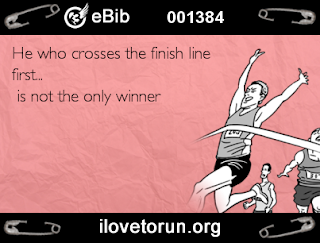 Would that have gotten me across the finish line faster? Probably. But, truth be told, I trained just as much as I wanted to. My summer training consisted of running three days (sometimes four) every week, one of which was a long run on each of the weekends. I did not have to sacrifice one church service to make the long runs happen since I did all of them on Saturdays (except for a couple that I did during the week if we had Saturday plans). I simply chose to control my running, and I refused let it control me. 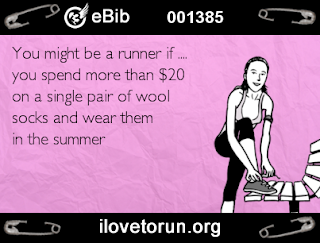 I have a husband and three amazing kids....I refuse to put them behind anything, including my running. That's how it works for me. So, my first marathon is done. And, guess what? Already, I have the desire to (maybe) do another, just not any time soon. 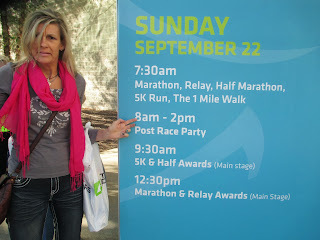 I have two half marathons coming up in October. Total cake walk(s) after doing 26.2.
still feels surreal typing that or even thinking it). Training for 26.2 miles has really been an eye-opening endeavor. 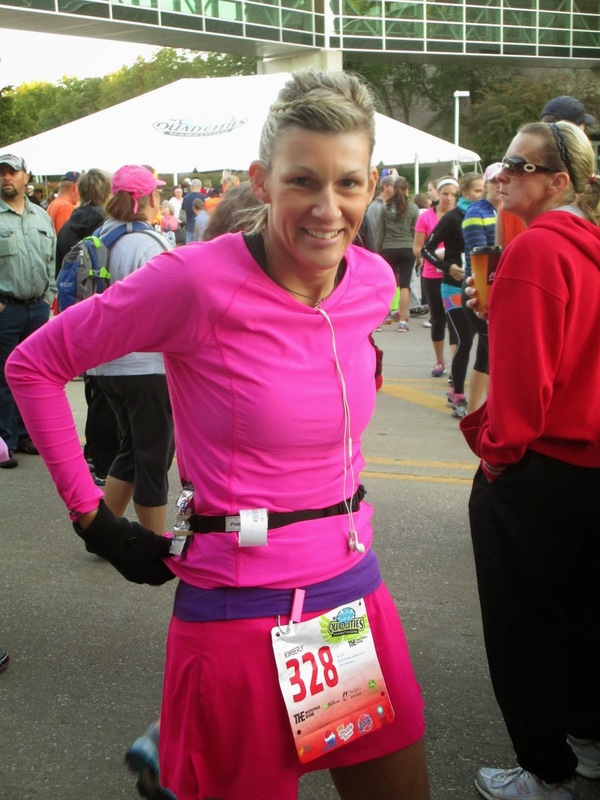 I've trained for many half marathons, and that is an entirely different ball game. 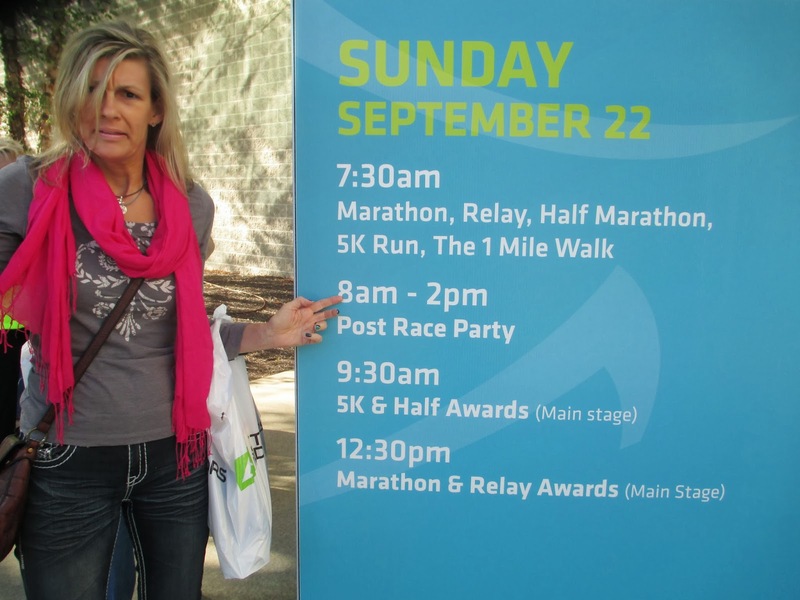 With half marathons, I didn't experience many of the not-so-lovely side effects until after race day. 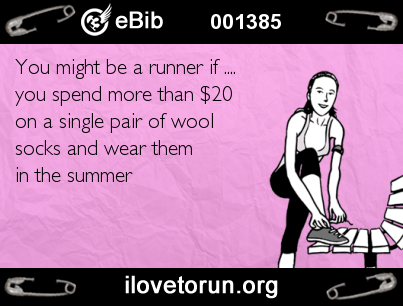 Training for a full marathon, though, was like running a half marathon almost every weekend...so there were many weekends attired in my race wear and wool socks. And, the icky toe nails made their appearance. I noticed my pace gradually slowing down as the weekly long runs became longer. I was able to finish most of the long runs, but at a slower pace than I was accustomed to. And that is a good thing. 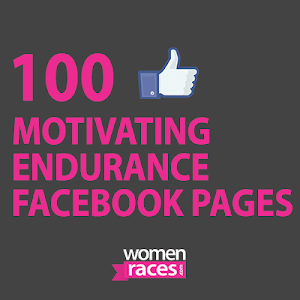 The training runs are all about going the distance, not setting PR's. 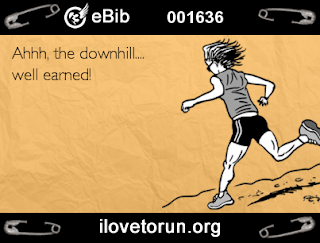 I ran a lot of hills. I don't particularly love hills, but I do love the results I get from them. That feeling of total bliss as you cross the summit is amazing, it totally makes all the sweat and effort of getting there worth it. Running truly makes me happy. It's my time to be alone in my own thoughts. 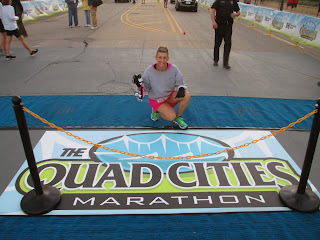 Training for 26.2 miles gave me an opportunity to test my stamina (mentally and physically) as I progressively ran further and further in preparation for the Quad Cities Marathon. August was a month for the record books for me. I had my four longest runs ever: 15, 17, 18 and 20 miles, and combined with my shorter runs gave me a grand total of 114 miles run in 31 days. Damn. 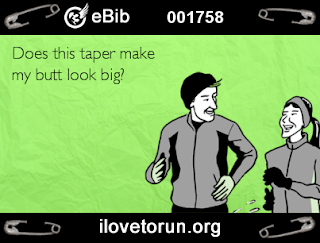 Then, let's not forget that dreaded 5 letter word most runners hate: TAPER. Actually, I welcomed the taper with open arms. Although I felt a great deal of pride and sense of accomplishment from all of the August miles, I was starting to resent the training. 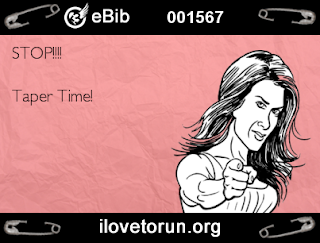 I love running, but I do not like having it "scheduled" and mapped out for me. It is too regimented for my liking. 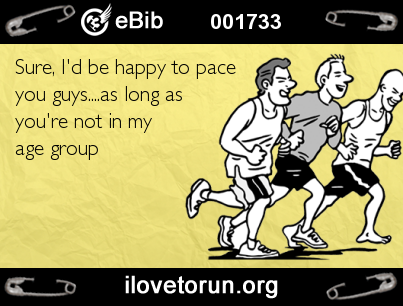 It makes me feel like a slave to the schedule, and that does not make me a happy runner for very long. So, Taper Time came at a most opportune time for me. Of course, with the taper comes the taper craziness. Restlessness. Eagerness. Anxiety. Hallucinations. 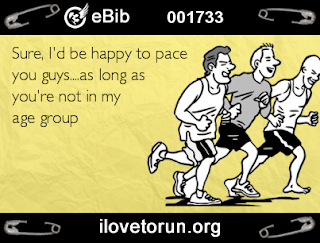 Through all of the training and tapering, one constant in my running life was the support of numerous fellow runners, many of whom were also training for marathons themselves. I can not thank these Virtual Running Buddies enough for all their advice, support, encouragement and numerous messages sent back and forth. I have not yet met any of these friends face-to-face, but we have formed solid friendships that I will treasure forever. My day is almost here. Soon, I will be able to call myself a marathoner. Despite all the blood, sweat and (minimal) tears, it has been a great journey. 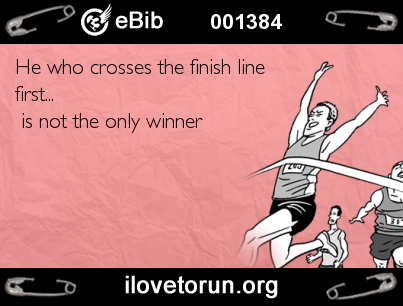 I don't expect to have an exceptionally fast finish time, but I will cross the finish line a winner for having gone the distance. 26.2 miles, here I come! 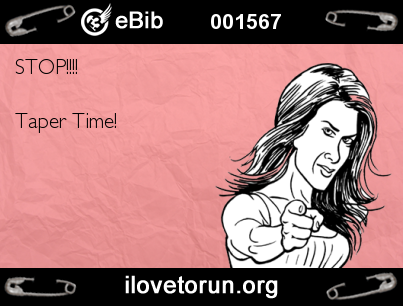 **These eBibs are some I made on the I <3 to Run site. Head on over and give it a whirl yourself! 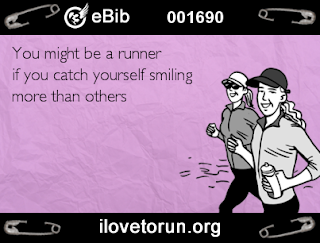 I have said many times that the half marathon is my favorite distance, and half marathon races are my bread-n-butter. An event I have run the past two years is the half marathon at the Park to Park Running Festival in Waterloo/Cedar Falls, Iowa. Park to Park was featured in Runner's World magazine recently as one of the top 100 half marathon events in the United States. Yes, it is that great! 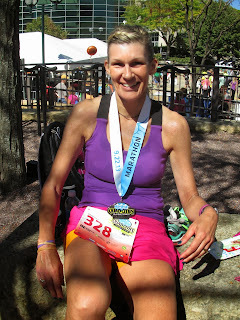 Having been running and training like crazy all summer, I was really excited to have "just" a half marathon to run this weekend. This was my going to be my third Park to Park half, and I was eager to not only PR, but I was hoping to knock a good 5 minutes off of my previous finish time. 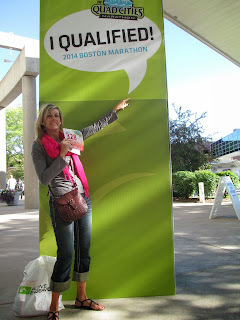 After all, I had just recently run 20 miles, 13.1 would be a cake walk. We have had a recent heat wave across the midwest, and Iowa has been very hot and humid as a result. We were lucky to get a few days reprieve, but the temps began creeping back up and by Friday the heat was back in the 90's, over 100 degrees with the heat index. The Park to Park staff were diligent in keeping the participants notified, via Facebook and email, to use caution on race day. We were urged to bring our own water, dress appropriately and, most of all, run wisely. They even graciously offered runners the opportunity to transfer their registration to a shorter distance (5K or 10K) for free. I really was not concerned about the heat or humidity. I had trained in it all summer, and the race started at 7:30 in the morning. The course is on several paths through a park (thus, the name Park to Park), so the course is flat and about 75% in the shade. Also, I had run this race twice prior, so there would be no surprises or unknowns. Perfect scenario. Having run a 20-miler recently, I allowed myself a couple days to recover and then ran 6 miles on Monday (at a decent pace), and also ran a quick 3 miles Wednesday evening (also at a great pace). I was ready and eager for the 13.1 at Park to Park. Earlier in the week, I had been experiencing some bladder/kidney "issues," and finally went to the doctor on Wednesday. All looked good, but she gave me an antibiotic as a precaution. No big deal. Saturday morning arrives, and I woke up to a strange feeling in the tummy. Nothing major, but something was "off." I had my ritual chai latte' and tried to choke down a bagel, but I had absolutely no appetite. I drank some water and headed to the race. I have been eating six energy chews prior to my long runs, but I could barely force four of them down. Nothing was tasting good, and I did not want anything else in my stomach. I had a spare gel, so I grabbed that to have with me for later. 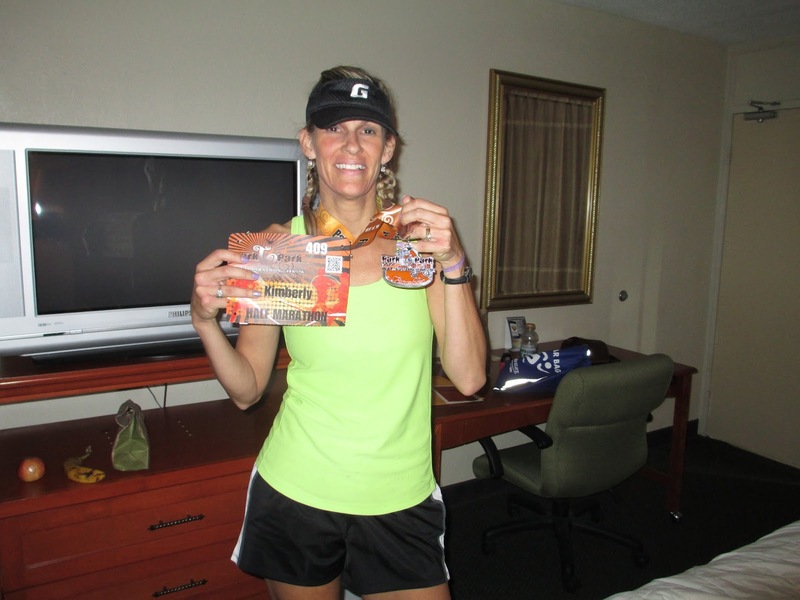 This race was over an hour away from my hometown, so I had driven there the night before and stayed in a hotel with a fellow runner friend, Barb. There also were several other locals from our town who had driven up that morning, so we hung out with them while we waited for the race to start. I don't usually get nervous prior to a race, but my stomach was really feeling strange. I kept hoping another trip to the porta pot would solve the problem.....but nothing was helping. Maybe things would settle after the race began. Usually it takes 3-4 miles before I get in my zone, then all goes well. The race started, I ran those first 3-4 miles, and still was not feeling much better. I was grabbing water at every water station, and pausing briefly as I drank it. I was keeping a 9-minute pace, but the groove had not yet started. I kept pressing on. I made it to mile 5 and decided to gulp down the gel a little early (I was planning to save it until mile 6 or 7). Mile 6 came and I could feel my pace starting to slow, but I tried to shake it off and continue on. My watch showed 56 minutes since the start of the race, so I was still pretty much on pace. Maybe the gel would kick in, and I could finally relax and coast to the finish line. About a half mile later, I just had to walk for a bit. Physically, I was in no pain but my energy level was at zero. My stomach was still feeling funky, so I grabbed more water at the next station. Off and running again, I made my way to the 8-mile mark. Then the 9-mile mark. More walking. More stomach stuff. Water at the 10-mile mark. More walking intervals. I also could feel a headache coming on. I kept glancing at my watch and realized the sub-2 hour finish time would not be happening. Neither would the PR (last year's time was 2:00:47). Despite the struggle of staying in the game, I never once considered quitting. I love running, and I love this race. I also know that sometimes things happen that we can't control, and we just have to press on to the finish. Since I had been walking so much, my calves were taking a beating. Every time I tried to run, I could only get as far as 20-30 steps before the muscles seized up and almost made me scream. I had to stop several times and stretch and massage them. But I kept going. It was a very hot and humid morning, but there also was a bit of a breeze. It really could have been ideal running conditions had my stomach not been on fire or my energy completely gone. I think I walked most of the final 2 miles because my calves kept cramping up when I attempted to run. Eventually, I made it to the finish line. My official time was 2:20:05. I am at peace with that. Really, I am. A lot of people finished much slower than myself, and the weather was a huge factor. I know I can run this distance 20-25 minutes faster and have done so (more than once), this was just not one of those days. I met up with all my friends, high-5'd the ones who had just completed their first official half marathon and things were good. I grabbed some Gatorade and wiped all the gritty salt off of myself. The idea of putting any food into my body almost made me gag, so I just drank instead. So, what went wrong? Well, hind sight is 20/20. I know I should have eaten more for breakfast, I probably had a carb crash from lack of food. But my stomach was feeling so funky, I had no appetite. Although I had trained diligently in the heat of summer, it was a very humid day for this race. I think I did a good job staying hydrated, prior to and during the race. Upon getting back to my house, I read the printout from the pharmacy for the meds I'd been taking....two of the possible side-effects are loss of appetite and diarrhea. SERIOUSLY? Why was that information in fine print? Suddenly, everything made sense to me. I had been taking these meds since Wednesday, and had noticed my stomach feeling a little off, but not enough to be concerned. I noticed my weight had gone down a few pounds, but also not something I am usually concerned with since my weight fluctuates daily depending on my water consumption. Thankfully, the diarrhea never made an appearance, but my stomach felt like it could explode at any moment while I was running. Also, I have learned that carb-loading is not a night-before-the-race thing, but needs to happen a few days prior to race day. I probably had not eaten enough on Thursday or Friday, causing me to (almost) crash and burn. For the most part, I am laughing at my experience now. I'm disappointed I didn't finish closer to my usual time of 2 hours, but I crossed the finish line on my feet. I had some severe (at the time) issues that slowed me down, but I did my best to not let them stop me. And, I have one more dose remaining of these antibiotics...so they should be all out of my system in two weeks when I cross the start line of the Quad Cities Marathon.